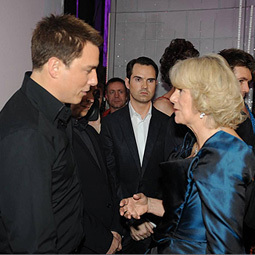 John was invited in 2006 and 2008 to perform at the Royal Variety Performance. Held annually since 1921 in aid of the Entertainment Artistes' Benevolent Fund, the Royal Variety show attracts world-renowned performers - The Beatles, Take That, Aretha Franklin, Michael Jackson, Lady Gaga and Leona Lewis have all performed before members of the Royal Family and a worldwide TV audience of more than 150 million. In 2006, the Royal Variety Performance took place at the London Coliseum before Their Royal Highnesses The Prince of Wales and the Duchess of Cornwall. John performed the show's opening number, a rendition of "Feelin' Good" set in a 1940's nightclub, accompanied by backing dancers. He introduced a few of the many other acts and closed the show with a medley inspired by Ferris Bueller's Day Off, before leading the cheers for Their Royal Highnesses and the singing of the National Anthem. John again joined a top-notch line-up for the 2008 show, held at the world-famous London Palladium on 11 December 2008. TRH the Prince of Wales and the Duchess of Cornwall were again in attendance. Singing his Gary Barlow-penned single, "What About Us?" and backed by five pairs of dancers, John was introduced by actor Josh Hartnett and was presented to Their Royal Highnesses after the show.